The Rolling Stones Charlie is my Darling. Ireland. 1965. The Rolling Stones Charlie is my Darling – Ireland 1965. The Rolling Stones roll into Dublin by train from Belfast at Amiens Street station (now Connolly station) for thier concert at the Adelphi Theatre. L-R: Bill Wyman (bass), Brian Jones (guitar), Charlie Watts (drums), Mick Jagger (vocals), Keith Richards (guitar) and manager Andrew Loog Oldham. This was the band's first Irish tour of 1965. ABKCO Films is proud to join in the celebration of the Rolling Stones 50th Anniversary by announcing exclusive details of the release of the legendary, but never before officially released film, The Rolling Stones Charlie is my Darling – Ireland 1965. The film marked the cinematic debut of the band, and will be released in Super Deluxe Box Set, Blu-ray and DVD configurations on November 2nd (5th in UK & 6th in North America). The Rolling Stones Charlie is my Darling – Ireland 1965 was shot on a quick weekend tour of Ireland just weeks after “(I Can’t Get No) Satisfaction” hit # 1 on the charts and became the international anthem for an entire generation. Charlie is my Darling is an intimate, behind-the-scenes diary of life on the road with the young Rolling Stones featuring the first professionally filmed concert performances of the band’s long and storied touring career, documenting the early frenzy of their fans and the riots their live performances incited. Charlie is my Darling showcases dramatic concert footage – including electrifying performances of “The Last Time,” “Time Is On My Side” and the first ever concert performance of the Stones counterculture classic, “(I Can’t Get No) Satisfaction.” Candid, off-the-cuff interviews are juxtaposed with revealing, comical scenes of the band goofing around with each other. It’s also an insider’s glimpse into the band’s developing musical style by blending blues, R&B and rock-n-roll riffs, and the film captures the spark about to combust into The Greatest Rock and Roll Band in the World. 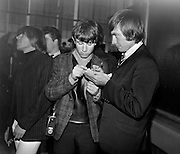 The 1965 version of Charlie is my Darling was produced by Stones’ manager/producer Andrew Loog Oldham who enlisted director Peter Whitehead to travel with the group and film them as “(I Can’t Get No) Satisfaction” rocketed the band to the pinnacle of the U.S. and U.K. charts. Whitehead, who would later capture “swinging London” in Tonite Let’s All Make Love in London, crafted a 35-minute version of the film (director’s cut) that would surface, from time to time over the years, usually seen with grainy visuals and out of phase music. Later, Oldham put together a 50-minute producer’s cut that was first seen in the 1980s. As noted, both the director’s and producer’s cut are part of the DVD, Blu-ray and Super Deluxe Charlie is my Darling release.